I have never been the biggest camper, but have always loved the idea or being more connected to nature. I remember when my partner and I went travelling overseas a few years ago carrying a 20 kilogram backpack and tent in tow. But there was always an excuse not to go camping – snakes, heat, snow – the list goes on! If there was an excuse not to camp, trust me we had it! And let’s not lie, we weren’t exactly equipped with proper camping gear, apart from our tent and sleeping bags. Last weekend I planned a little camping adventure for my man’s birthday. And this time it was going to go ahead – rain, hail or shine. Alas the weather gods didn’t exactly come to the party, with a weekend of thunderstorms, gale force winds and hail scheduled! It appears that Melbourne has forgotten its spring. 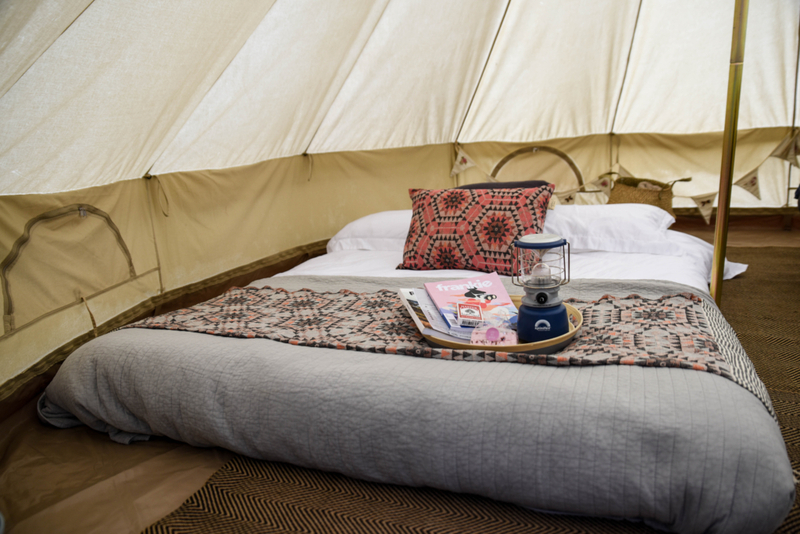 Perhaps the term “camping” is a little exaggerated on this occasion; it was more of a glamping experience – with a few creature comforts thrown in by the lovely people from Twilight Glamping. 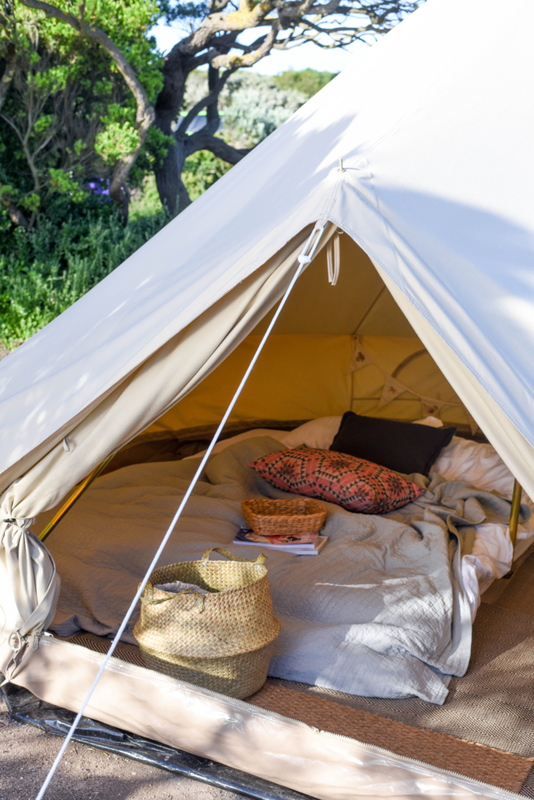 Twilight Glamping is the brain child of Jan Juc duo Beth and Lee Brown. 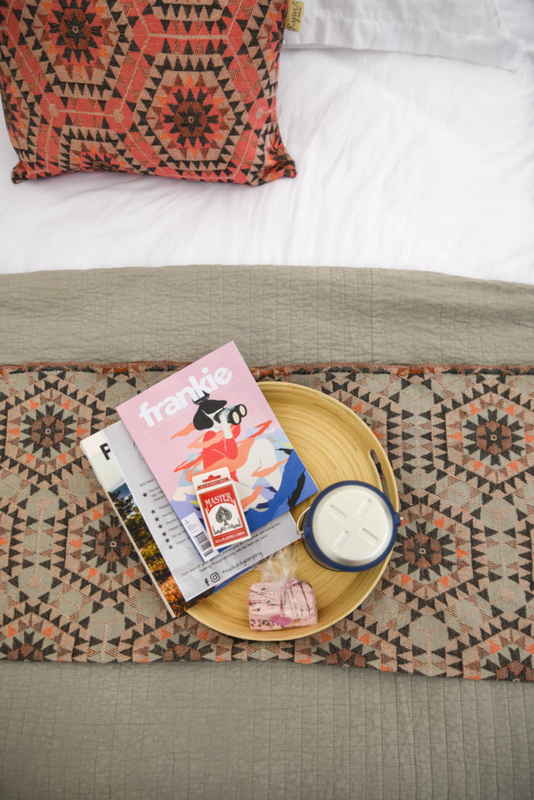 The idea was conceived from their love of the outdoors, festivals and whimsical childhood memories. 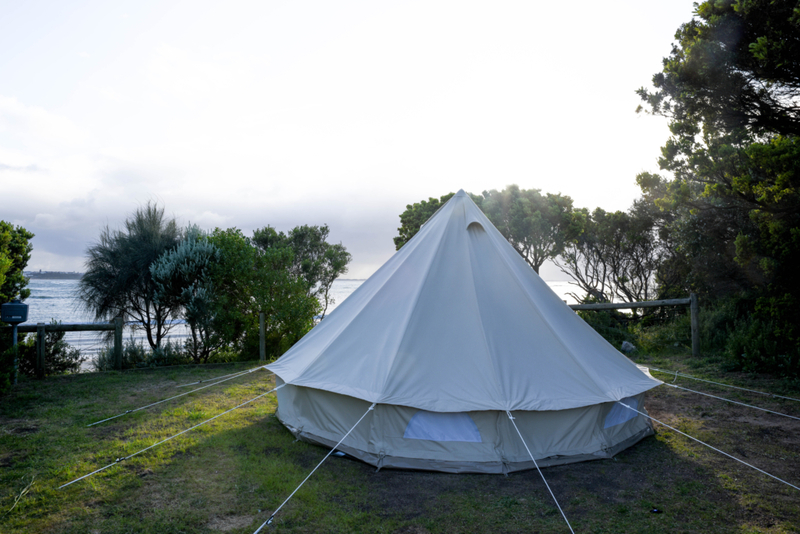 Twilight Glamping is all about “camping out on summer nights, watching warm sunsets and sleeping beneath star lit skies.” Being a mobile business, gives glampers the added benefit of being able to choose a camping site of their choice from Torquay to the Kennettt River. 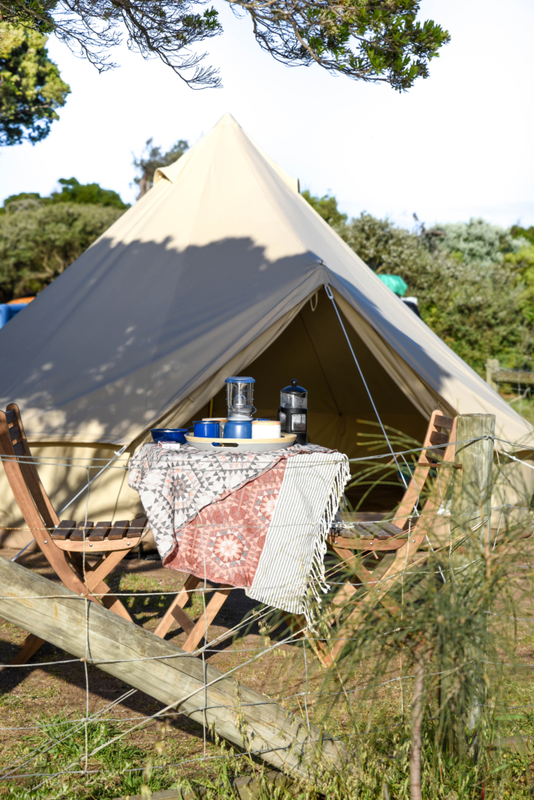 We had never been to Barwon Heads before so jumped at the opportunity to glamp on the foreshore at Barwon Heads Caravan Park. Arriving after sunset on Friday evening, it was an a adventure trying to find our bell tent, with the faint illumination of our torchlight from our phones. Nearby tents were battling with the gale force winds to stay upright. Luckily our tent had been set up in the afternoon so we had the easy job of just rocking up and getting settled. 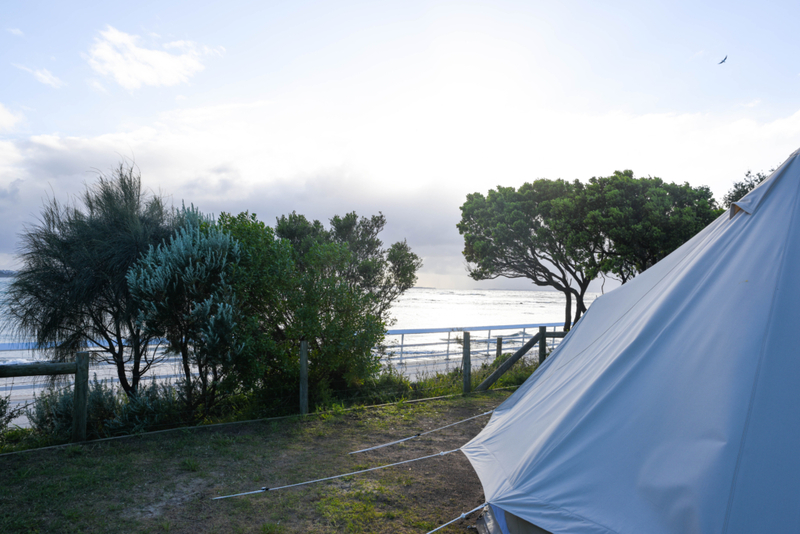 Wrapped in layers of winter woolies, we unzipped the front of our tent to discover our home for the weekend. 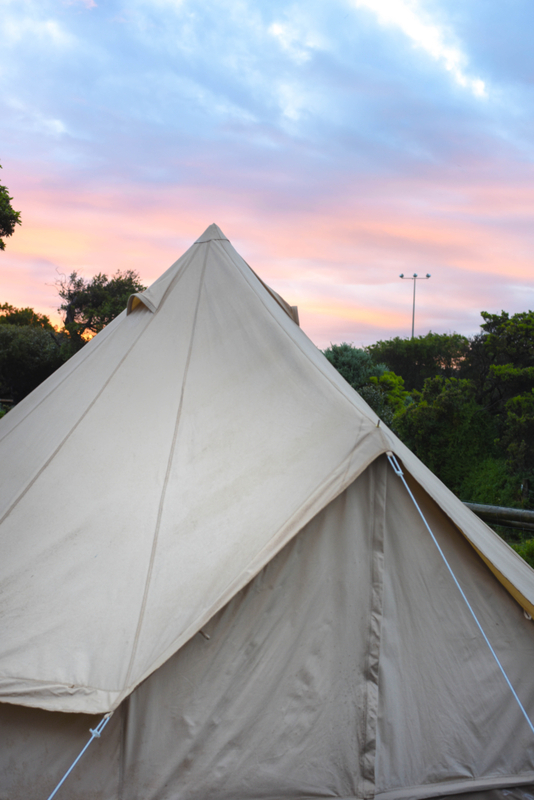 Our bell tent was surprisingly spacious inside, including a queen bed with blankets, pillows and throws. There was even a tables and chairs for dining, plenty of kitchen gear and a gas cooktop. Our bell tent was beautifully decorated, in a bohemian style, with bunting and a dream catcher. And was surprisingly warm and cosy inside! 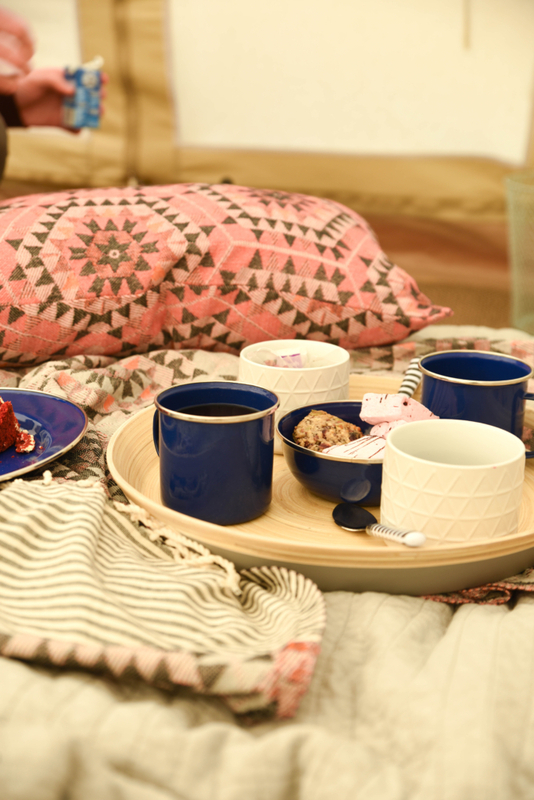 Since we upgraded to Twilight Glamping’s Moonlight Package we were treated to some delicious goodies on arrival, including a mini hamper with wine, chocolates and cookies. 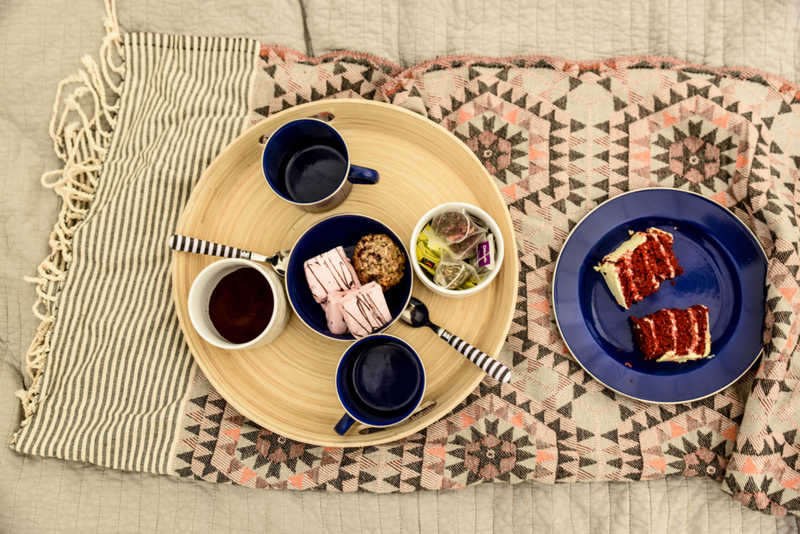 With just lamp light to illuminate the tent we spent the evening reading books, eating cake and playing cards and fell asleep under the stars listening to the sound of the waves crash upon the shore. 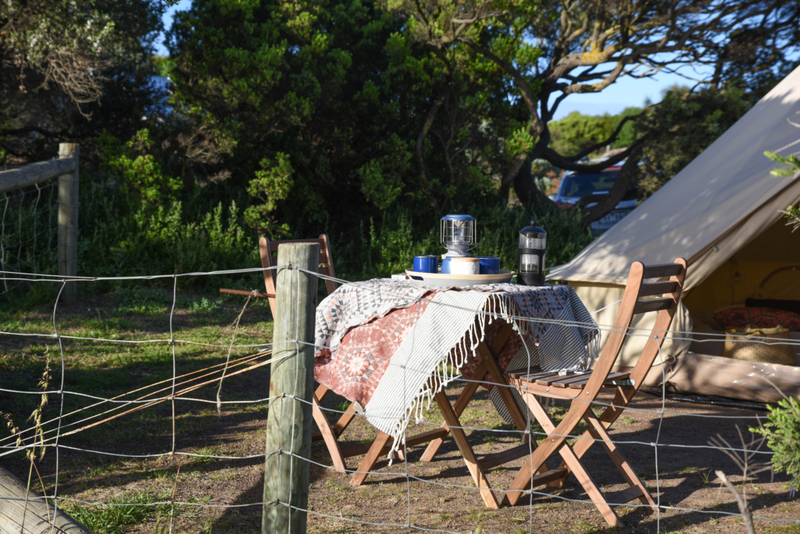 Barwon Heads Caravan Park is the perfect base for a weekend on the Bellarine Peninsula. 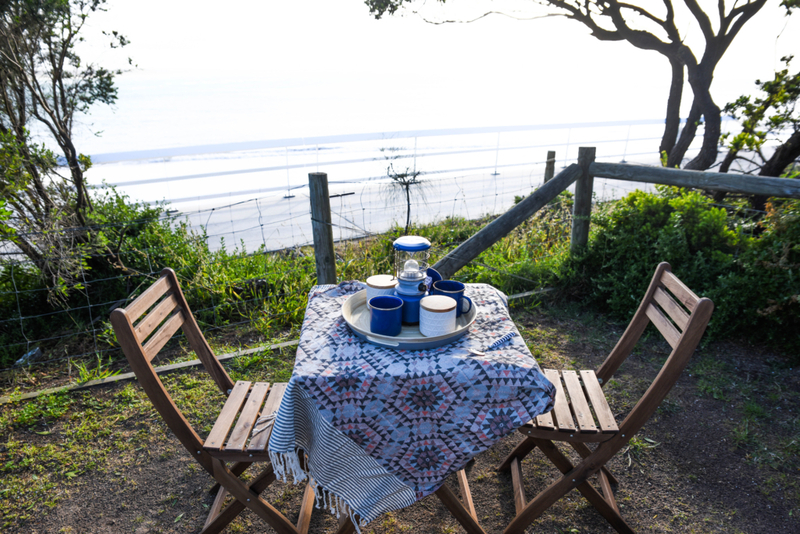 Situated right on the banks of the Barwon River, where the river meets the sea, its the perfect spot to sit ocean side and watch the world go by. 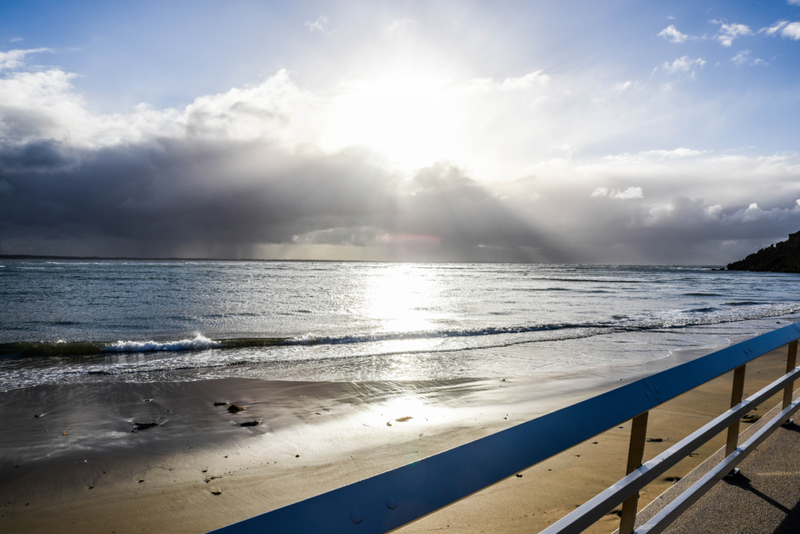 On the weekend, we went for a drive along the spectacular Great Ocean Road to Lorne then explored the Bellarine coast from Barwon Heads to Queenscliff. But there’s also plenty to do locally, whether it be swimming, fishing, cycling or surfing. Head to the beach, turn right and climb the stairs for spectacular views over the bay and the river estuary. 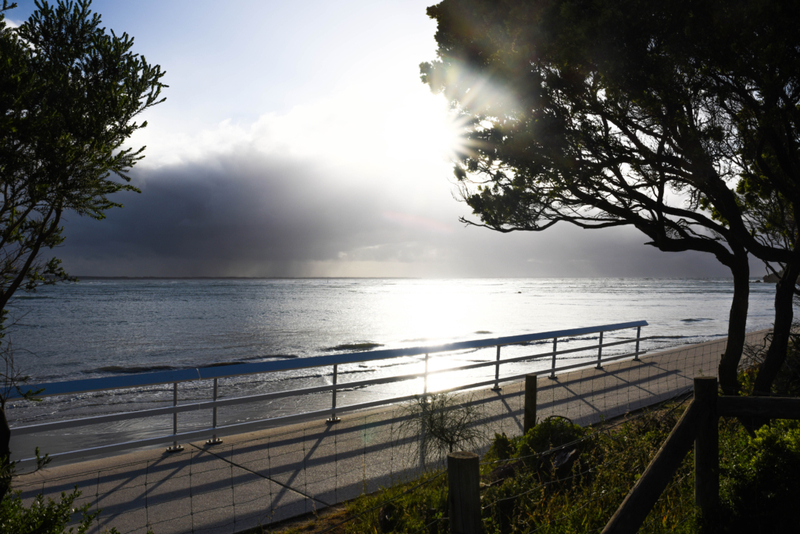 The park is also a short walk to the Barwon Heads township. Don’t miss Annies Provedore for a delicious range of local produce like cheese, meats and freshly baked bread – perfect for a picnic. It’s the perfect spot for coffee and breakfast, with its cosy, rustic atmosphere. 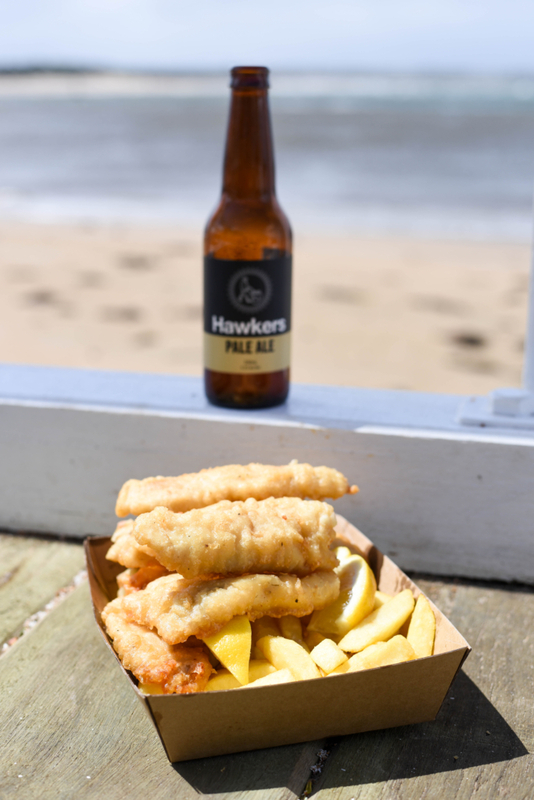 There are also a couple of great fish and chip shops for a beach picnic. With no power to charge the phone on our site, it was lovely to have a digital detox and really enjoy the outdoors in all its glory. 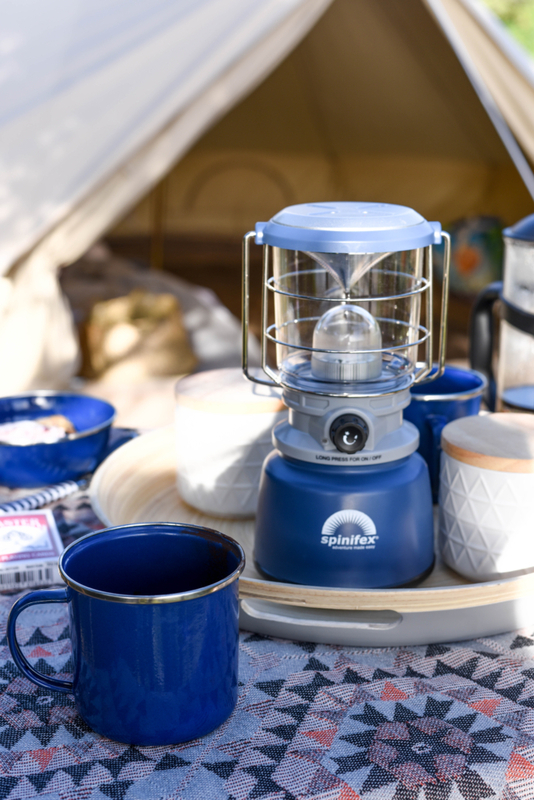 There’s something about preparing your own meals on site, which makes them taste better and we absolutely loved having a coffee in the morning by the ocean. Thank you Twilight Glamping for a wonderful weekend away! Welcome to Lisa Eats World, a blog which shares two of my biggest passions in life - food and travel. My aim is to “eat the world” one inch at a time and explore as many different cuisines and cultures as possible. I hope you enjoy my wanderings and stop by again soon! Sign up to get updates delivered straight to your inbox.